List of European city guides with tips on the best things to see and do in many European cities; with reviews of the top attractions and restaurants .Many of our Europe city guides include insider tips from local residents. I’ve enjoyed getting off the beaten track in London and exploring some less well known areas of the capital. This approach started for a couple of reasons. I’d seen many of the big attractions in central London and I decided to look further afield to find more affordable hotels. Based on recent stays at hotels outside the city centre, here are my tips for discovering London beyond the tourist hotspots. West India Quay isn’t as well known as its neighbour Canary Wharf. It’s home to the Museum of London Docklands, where you can find out about London’s history as a port in this former warehouse. I learned about the Princess Alice disaster, in which more than 650 passengers of this paddle steamer died in a collision with another vessel in the River Thames. The Museum of London Docklands is free to enter and open every day, except 24 -2 December, from 10am to 6pm. The West India Quay footbridge sits on pontoons which enable the bridge to rise and fall as water levels change. The bridge looks at its best after dark once it’s illuminated. There are several pubs and cafes with outdoor seating in the Quay. I was there in November, so sat inside to eat my fish and chips at the Via Bar. The main meetings as St Peter’s Barge floating church are on Sundays at 10.30am and 6pm, after which free coffee and cake are served during the open forum discussing a theme from the bible. It only takes a few minutes to walk to Newham City Farm from Prince Albert Station on the Docklands Light Railway (DLR). The city farm has been operational since 1997. I found it interesting to watch a blacksmith shoeing a horse during my visit.Â Newham City Farm is free to enter and it’s closed on Mondays (except Bank Holidays); it’s open from 10am – 4pm in Winter and 10am – 5pm in Summer. In North Clapham’s Landor Road you’ll find the Landor Pub, which has a small theatre on the first floor, and the Sew Over It sewing cafe and shop. You can have a Greek feast at Sappho’s Meze Bar, just down from North Clapham Tube station, for around Â£11. Make sure that you have cash, as they don’t accept card payments. I walked to the Geffyre Museum, close to Hoxton Overground Station, when I was staying in Bethnal Green, The museum focuses on the history of the home, with rooms from different periods of history. It’s free to enter, open 10am – 5pm, but closed on Mondays (except Bank Holidays). Royal Victoria Dock, which opened in 1855, was the first London dock to be built for large steam ships. The Dock’s traffic dropped with the introduction of container ships, leading to closure in 1980. It was in the spotlight in 1988 when Jean Michel Jarre, a French electronic musician, performed an outdoor concert there. Excel, the huge exhibition venue, opened close to the dock in 2000. From the dock you can cross the River Thames in the Emirates Air Line cable car to North Greenwich. The Crystal is home to the World’s largest sustainability exhibition with ten zones looking at issues such as cities of the future, smart buldings and urban planning. Admission costs Â£8 per adult and it’s free for under18s or those in full time education. Opening hours are Tuesday to Sunday 10am -5pm, with late opening until 7pm on Saturday and Sunday. I’ve walked several sections of Regent’s Canal including from Mile End to Victoria Park. I’d seen Limehouse Basin, previously called Regent’s Canal Dock, on many occasions from the DLR train en route to the Excel exhibition centre to attend the World Travel Market. When I was staying in Stepney Green, I finally got around to visiting Limehouse Basin, which was built to enable ships to transfer their cargo onto barges for transportation along Regent’s Canal. I stayed in Woolwich, as it was within walking distance of Excel by either taking the free Woolwich Ferry or walking through the Woolwich Foot Tunnel, to get across the River Thames. At Royal Arsenal in Woolwich, there’s the Fire Power Museum, the Royal Military Academy and the Greenwich Heritage Centre. The Museum of Childhood is located close to Bethnal Green Tube station. I spotted quite a few items from my childhood, such as a Chopper bicycle and troll dolls. It’s free to enter, the museum is open every day from 10am – 5.45pm. Brixton Village is a covered market in south London. There’s an array of ingredients for Caribbean cooking and restaurants from around the World. I ate at the Casa Morita Mexican restaurant. The Ragged School Museum was formerly a Dr Barnardo’s school. On Sundays, at either 2.50pm or 3.30pm,Â you can attend a 45 minute Victorian lesson. The teacher will be in costume and you can try writing on a slateboard.Â It’s free to enter the museum (although a donation of Â£2 for the lesson is suggested). Opening hours are limited,10am to 5pm on Wednesday and Thursday, 2pm to 5pm on the first Sunday of the month. I hope that you’ve enjoyed my tour of London off the beaten track. I start my hotel search on a price comparison site, such as HotelsCombined, which trawls through 30+ travel sites to find the lowest hotel prices. My next step in finding a hotel in London, is to check out the websites of large chains such as Accor, which have a good selection of value rooms in various areas in London. I’ve rarely found cheaper prices at hotel chains on price comparison sites. Once I’ve found some keenly priced rooms, I check that the hotels are located close to good public transport links; I find the Tube or Overground easier to navigate than the bus. Then I have a look at things to do and see in, or close to, that area. Based on my research, I narrow my options to two or three hotels which offer a combination of a good price, accessibility and location in an interesting area. Before booking, I check if there are any discount codes or cashback available for these hotels. This entry was posted in City Guides, England, Photos and tagged London on May 7, 2014 by Karen Bryan. The gorgeous Danish capital of Copenhagen is full of history and culture and can easily keep you busy for an extended stay. This post features 25 things to do in Copenhagen so I can guarantee you’ll find a few of special interest to you. 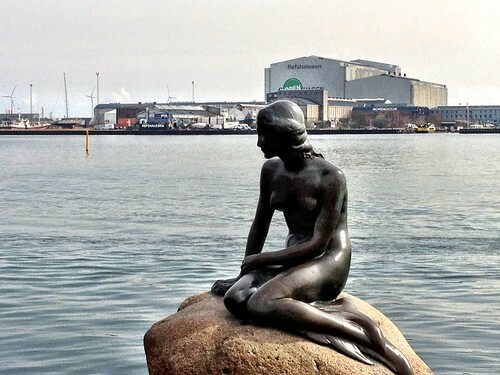 Undoubtedly the most well-known symbol of Copenhagen is the statue of the Little Mermaid, the title character from one of Hans Christian Andersen’s tales. While she may be smaller than you imagine, it’s probably difficult to visit Copenhagen and not stop by for the obligatory picture. Like many northern European cities, you can really get a great view of Copenhagen by taking a cruise through its canals. It’s picturesque, relaxing and there are several guided versions that supply you with all kinds of interesting bits of information about the city as you cruise. This entry was posted in City Guides, Denmark on August 3, 2012 by Amanda Kendle. Rome is one of those very special cities with so much history and culture that you could easily spend weeks there and still feel you didn’t want to leave. Rome is included in our best European cities to visit post. Our top tips for what to do in Rome is a collation of posts by the Europe a la Carte blogging team, with insider tips from local resident Kimberly Sullivan. This entry was posted in City Guides, Italy and tagged Rome on August 5, 2011 by Amanda Kendle. The Estonian capital of Tallinn is a relatively recent find, a city that was pretty much hidden from our travelling radar during the years of the Soviet Union. But when the Cold War ended it certainly sprang to life very quickly and became a hit with tourists, for many reasons – it’s an attractive city with lovely architecture, there are both interesting and unusual things to do. We’ve collated our tops tips into a Tallinn guide to help you plan you visit. Tallin is featured in our best European cities to visit post. The Kumu Art Museum in Tallinn is in a very modern building and is just five years old. It covers Estonian art from centuries ago right up to modern times. This entry was posted in City Guides, Estonia and tagged Tallinn on August 2, 2011 by Amanda Kendle. The Belgian capital of Brussels is sometimes overlooked as one of Europe’s less exciting cities but we here at Europe a la Carte definitely think otherwise and Brussels is featured in our best European cities to visit post. Here are some of the great things to do in Brussels from the blogging team, whether your interests are museums, shopping, Art Nouveau architecture or (in my case) Belgian chocolate! This entry was posted in Belgium, City Guides and tagged Brussels on July 21, 2011 by Amanda Kendle. While Bristol may not be the city that jumps to your mind when you think of planning a holiday, it is apparently fourth on the list of the most visited cities in England, and when you discover the long list of interesting sights to see in Bristol, you won’t be surprised. As the hometown of former Europe a la Carte contributor Heather Cowper, we have some very useful inside knowledge and I’ve drawn on Heather’s posts as well as adding some tips of my own to compile this list of top things to do in Bristol. The Bristol City Museum and Art Gallery, easy to find in a large Edwardian building on Park Street, includes all kinds of artefacts like Egyptian mummies, a biplane and a Romany caravan, and it also features excellent temporary exhibitions (such as the Banksy Exhibition it hosted a couple of years ago) which are also free to see. Coming soon to Bristol, the M Shed looks set to be the key museum attraction in the city. Located at the site of the former Bristol Industrial Museum, the M Shed has been five years in the making and is due to open in June 2011. 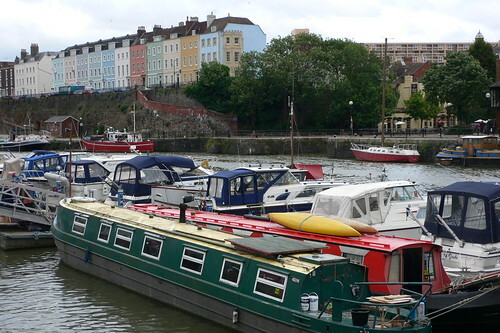 It will explore life and work in the city of Bristol and as it is located quayside a number of historic vessels moored in front of it will also form part of its exhibitions. The Georgian House is a restored townhouse turned museum demonstrating life for the wealthy merchant John Pinney and his family back around the year 1800 – and as a bonus, admission is free. Similarly, the Red Lodge, furnished in a mix of Elizabethan, Stuart and Georgian styles also contains exhibitions from its past inhabitants and is also free to enter. 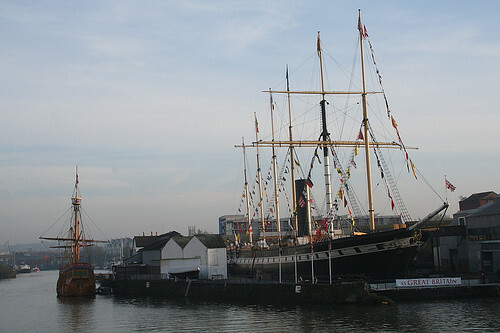 The restored SS Great Britain, a ship that dates back to 1843 and has travelled as far and wide as New York and Australia, is now moored in the Harbourside area and is fascinating to visit. 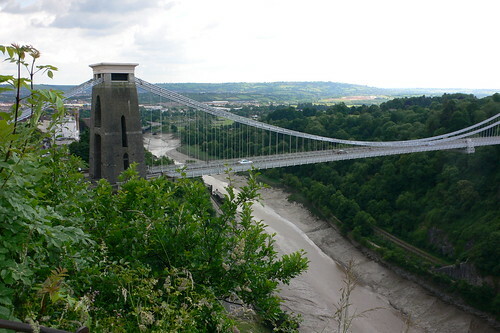 The Clifton Suspension Bridge is probably one of the most recognisable sights of Bristol. Designed by famous Bristol Victorian-era engineer Brunel, construction on the bridge started way back in 1836, although it wasn’t complete until 1864. These days it is not only a tourist attraction but a functional bridge carrying thousands of cars daily. The Harbourside in Bristol is home to numerous landmarks including Millennium Square, Pero’s Bridge (complete with horns!) and the Steam Train which runs up and down the quay. You can also use the local ferry service to explore the harbour from the water. And while the Harbourside area of Bristol gets most of the attention these days, the original Old City is also worth a look. 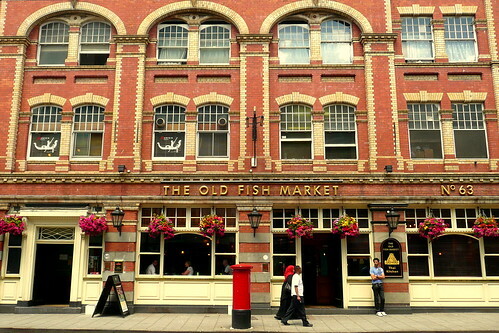 The St Nicholas Market, Castle Park, St Peter’s Church and the areas around King Street and Corn Street all include historical buildings mixed with some interesting modern-day shopping and eating. The recent See No Evil street art project is the UK’s largest permanent display; it’s the product of more than sixty international street artists. The Bristol Zoo Gardens once won Britain’s “Zoo of the Year” and is still a quality zoo to visit. 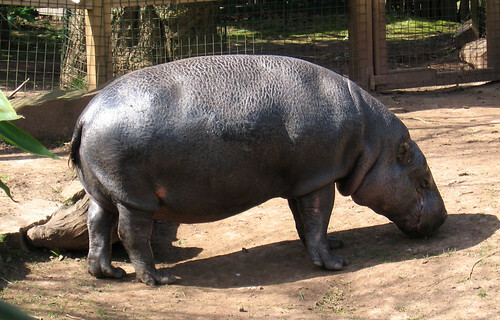 It’s 175 years old and some of the animal highlights include red pandas, pygmy hippos and the seal and penguin section. Animal-loving visitors might want to continue the theme at the Blue Reef Aquarium Bristol, an aquarium designed around a large coral reef centrepiece and including various fish and sharks which can be seen from the underwater viewing tunnel. Families will also have plenty of fun (and a little learning!) 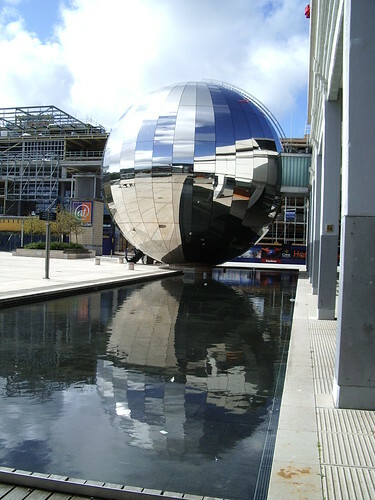 at At-Bristol, a large science museum which also includes a Planetarium – housed in a particularly cool building! The lovely town of Bath is only 12 miles from Bristol. Click here to find the lowest prices on Bristol hotels using the HotelsCombined price comparison site. This entry was posted in City Guides, England, UK and tagged Bristol on April 27, 2011 by Amanda Kendle. Bath is known as the oldest tourist destination in Britain and is famous for both its Roman baths and its typical Georgian architecture, and being just 100 miles from London makes it a relatively easy destination for visitors to reach. This compilation of the top things to do in Bath includes the sights dating right back to ancient times, but also has plenty of highlights for Jane Austen fans too! The most famous thing to do in Bath is to visit the Roman baths. They’re on the site of the only hot springs in England and date back two thousand years, and touring the baths includes checking some underground tunnels along with incredible archaeological finds – and you can even taste the water! Just behind the Roman baths you can’t miss seeing Bath Abbey, a thousand year old church which is particularly famous because the first King of England was crowned here. You can see this and the baths by following one of the free walking tours which Heather found. The other sights which pop up most commonly on Bath postcards and tourist paraphernalia are the Georgian style buildings which cover the city. It’s easy enough just to stroll through the main streets and admire the architecture. Heather visited The Assembly Rooms and Museum of Costume on her trip to Bath. 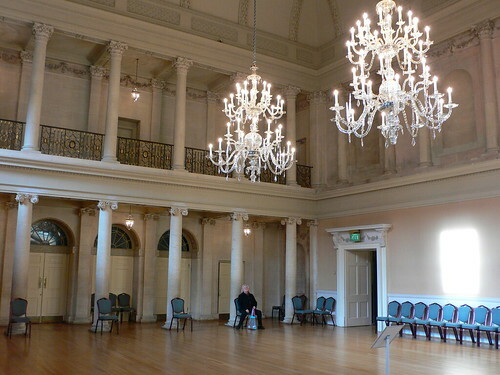 The Assembly Rooms include the Ballroom and other spots for socialising made famous by Jane Austen’s novels. Downstairs, the Museum of Costume showcases the typical styles from the 1800s – some of which you can even try on! The Building of Bath Museum is small, but often rated as one of the most interesting museums in Bath. In particular, it looks at the development of the Georgian aspects of Bath and includes some great cross-section models to show what Georgian houses looked like both inside and out back when they were first built. Heather also recommends visiting No 1 Royal Crescent, a townhouse converted to a museum showcasing the Bath of the late 18th century. Jane Austen may have only lived in Bath for five years, but her legacy to this city has lasted centuries. Whether you’re a true Jane Austen fan or just have some acquaintance with her work (or the films and TV series derived from it), you’ll definitely encounter some Jane Austen-related attraction while in Bath. Keen fans can take the Jane Austen Walking Tour which includes stops at locations featured in her novels and their film adaptations, with knowledgeable guides throwing in Jane Austen trivia with every step. You can also visit the Jane Austen Centre, a mock-up of her home which even includes some of her manuscripts and personal articles. They run a documentary film inside and it’s also very nearby the actual house where Jane Austen lived while in Bath. And finally, if you remember the Pump Room featured frequently in Jane Austen’s “Northanger Abbey”, then you can also visit the Pump Room today. These days it is a rather expensive place for a snack but it does make you feel a little bit closer to Jane Austen and her fascinating characters! 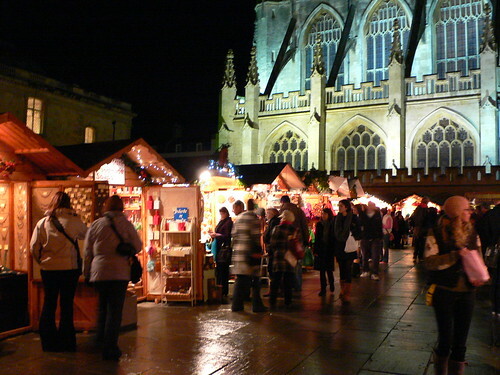 If you time your visit for Christmas time, then you can take in the Bath Christmas Markets which are held in the main square outside Bath Abbey (and spread further through the city centre as well), with all the features of a European Christmas market like mulled wine, local foods and handmade gifts. This entry was posted in City Guides, England, UK and tagged Bath on April 20, 2011 by Amanda Kendle. Here’s my round up of all our travel tips on things to do in Zagreb, the capital of Croatia, from our expert Neha. It’s one of those cities that a lot of people pass through on their way to somewhere else but don’t stop to appreciate – I’m guilty of that too, having spent two or three hours there in the middle of the night while changing buses! If you are planning a trip to Croatia, then take some time to explore Zagreb with the help of Neha’s insider tips. The main cathedral of Zagreb, the The Cathedral of the Assumption of the Blessed Mary, is an impressive neo-gothic building with particularly tall spires, and you can use them to navigate your way around the town centre. The Croatian National Theatre is also well worth a look, and if you have any interest in opera, ballet or theatre, then check out what will be performed during your visit. Zagreb’s Old Town is also full of intriguing architecture, including the LotrÅ¡Äak Tower, which dates back to the 13th century. These days you can climb to the top of the tower for some good views over Zagreb. You should also take a look at the Stone Gate in Zagreb, the only surviving town gate from medieval times. You will also inevitably come across Illica, the main street of Zagreb. Look out for the cafes in between the numerous buildings; there is also plenty of convenient accommodation along this street and it’s a handy location to stay in. If you’re visiting in December, then the main city landmark becomes the Zagreb Christmas Markets, with a giant Christmas tree being erected on the main square and numerous stalls being set up to sell all kinds of Christmas fare. One of the most visited museums in Zagreb is the Zagreb City Museum, housed in an old convent in the Old Town. Exhibits range from artefacts from the Iron Age through to modern models of the city of Zagreb. Art lovers will get a lot out of this round-up of five Zagreb galleries, including the Zagreb Museum of Contemporary Art and the Mestrovic Studio where famous Croatian sculptor Ivan Mestrovic’s works can be found. In the Old Town you can find the Croatian Museum of Naive Art; there were several famous Croatian artists in the naive style in the 1930s and they popularised this art form, making this museum full of the works of successful local artists. The planners of Zagreb apparently realised the importance of parks. The largest green area in Zagreb is Maksimir Park. It includes a running track, several cafes, a new zoo and concerts during summer. Closer to the centre, the Lenuciâ€™s Horseshoe (or Lenucijeva Potkova) is a series of parks and squares running between the main station and the main square in the shape of a horseshoe. And finally, while not quite a park, the tree-lined Strossmayer Promenade is still very green and is also home to the Strossmarte street festival during the summer. Neha recommendations for locations in which to sip a coffee include Tkalciceva in the city or slightly further afield at the artificial lakes of Jarun or the Sljeme peak (reachable by cable car). If you want to escape winter in Zagreb, Neha recommends heading about two and a half hours away to Volosko, a small fishing village on the coast which has a reputation for warmer weather. It’s famous for its seafood restaurants so take your appetite with you! One of the most obvious day trips from Zagreb is to head to the Plitvice Lakes. This is one of the most beautiful places I’ve ever visited and I can’t recommend it highly enough, except to say that rather than making a day trip from Zagreb to Plitvice, try to stay there for a couple of days instead. Neha also recommends several other day trips from Zagreb, including Samobor, Veliki Tabor and Trakoscan castles and Krapina. 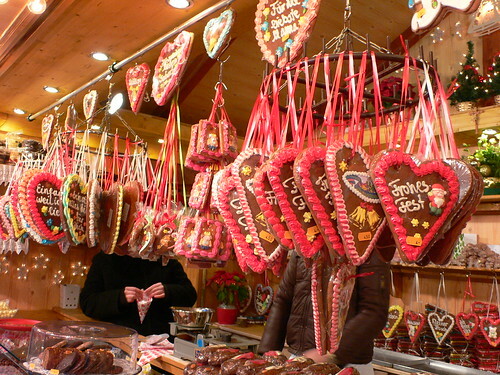 This entry was posted in City Guides, Croatia and tagged Zagreb on March 31, 2011 by Amanda Kendle. There are plenty of great things to do in Dublin, and they don’t all involve drinking Guinness! Like many Australians, I’ve got a decent chunk of Irish blood in me (my grandmother was a Murphy) and I’m sure that’s why places like Dublin are so attractive to me. I’ve compiled some of the best tips we’ve had on Europe a la Carte to help you plan your trip to Dublin. The Irish capital is featured in our best European cities to visit post. Dublinia houses an interactive history of Dublin during the age of the Vikings and Medieval times. Marcus visited and suggested it would be an especially good outing for families with children. Next to Dublinia is the beautiful Christ Church Cathedral. It’s the oldest building in Dublin (dating back to the 11th century) and you can get a combined ticket with Dublinia if you want to save some money. I’m always a fan of libraries and was pleased to hear that Karen particularly liked the Chester Beatty Library on her trip to Dublin. It is situated inside the gardens of Dublin Castle (another great place to visit!) and it’s one of Dublin’s free attractions. Karen’s favourite Dublin sculpture was Phil Lynott of Thin Lizzy Fame. My personal tip for something to do in Dublin is to head to the Dublin Writers Museum – obviously Ireland is home to many famous authors and this museum showcases the lives and literature of writers such as George Bernard Shaw and W. B. Yeats. For many travellers, visiting Dublin is synonymous with drinking Guinness, and Marcus decided to tour the home of Guinness in Dublin. The tour goes through the Guinness Storehouse and basically covers the history of Guinness (but unfortunately doesn’t show the brewing in progress) – but the highlight comes at the end when all tour participants receive a freshly brewed pint of Guinness. There are numerous different walking tours to take around Dublin. Marcus took a free walking tour (tips appreciated of course) with a New Europe Tour guide and was impressed that they really ran the tours no matter what the weather, and he considered it a good basic introduction to the city’s sights if you hadn’t been to Dublin before. Karen went on the “Original Tour” with a Historic Walking Tours of Dublin guide which cost 12 Euros at the time, but seemed to be well worth it. It takes in sightseeing spots like Old Parliament House, Trinity College, Temple Bar, City Hall and so on and lasts about two hours. For a tour of a rather different kind, you might try the Dublin Ghost Bus Tour. Lindsay took the tour and found it a little more on the silly side than the scary side, but said it was actually a fun way to learn about some of Dublin’s history in a completely different way. Karen has some excellent tips on where to shop in Dublin in her unique shopping venues in Dublin post from her last trip there. Stephen’s Green Shopping Centre sounds lovely, as does the Powerscourt Centre, built around an 18th century mansion. If you’re looking for a good meal, Karen also wrote up reviews of a couple of good restaurants, including Bewley’s Cafe and Restaurant in Grafton Street and the Church Cafe and Bar near the Jervis Shopping Centre. This photo of the Church’s Irish stew is making me hungry! Click here to check out the best deals on Dublin hotels using the HotelsCombined price comparison site. On her last trip to Dublin, Karen stayed at the Arlington Hotel near O’Connell Bridge, which has a very central location and friendly staff. This entry was posted in City Guides, Ireland and tagged Dublin on March 29, 2011 by Amanda Kendle.